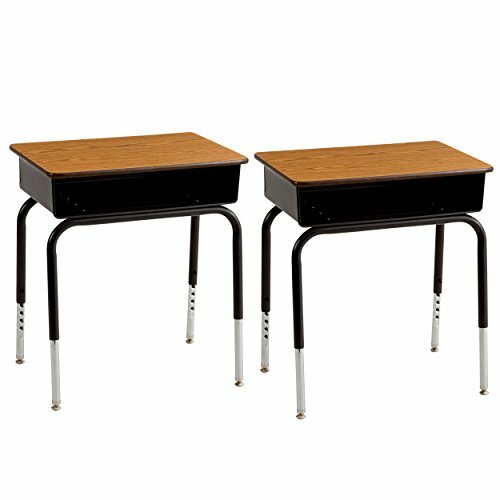 ECR4Kids 24'' x 18'' Adjustable Open Front Student Desk with Metal Book Box, Oak and Black (2-PacK) by ECR4Kids at Indsight. MPN: ELR-24101. Hurry! Limited time offer. Offer valid only while supplies last. Say hello to the classic open front desk with a twist. The ECR4Kids Open Front Desk is a generously sized take on the classic open front desk. Say hello to the classic open front desk with a twist. The ECR4Kids Open Front Desk is a generously sized take on the classic open front desk. Featuring a metal book box with indented grooves to hold utensils and other educational supplies, this desk is ideal for student use at home, school, church or learning centers. The sleek chrome legs are adjustable in one inch increments from 24”H to 30.5”H to accommodate growing children, so you can use it year after year. Legs also feature self-leveling nylon swivel glides to keep desk flat and stable. This two-desk pack provides an excellent solution for a small group. Available in your choice of attractive laminate finish. Recommended for children ages 7 and older. Light adult assembly required. Open Front Desks are GREENGUARD[GOLD] Certified for low chemical emissions into indoor air. With a concentration on the Pre K-12 sector, ECR4Kids offers a wide range of products including classroom tables and chairs, preschool rest time solutions, hardwood storage cases, blocks and manipulative, mobile organizers and a variety of indoor and outdoor play structures.